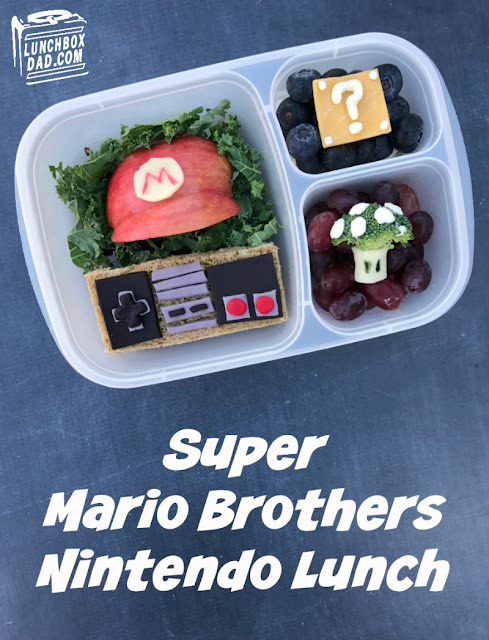 Lunchbox Dad: Super Mario Brothers Lunch and Visit to Nintendo HQ! Super Mario Brothers Lunch and Visit to Nintendo HQ! Let's just be blunt and get this out there. Super Mario Brothers 3 is the best video game of all time. There I said it. As a kid, I spent hours trying to beat this game. The kicker is that I never owned an original Nintendo Entertainment System. I always wanted one. Correction. I lusted after them. The only time I was able to play one was at a friend's house, or when there was a special occasion and I could rent one from the local video store in our town. Remember those places? Needless to say I've always been obsessed with this game console. able to pick up a new NES Classic edition at the Nintendo store, and it is not only nostalgic to play all of the old games from my childhood, but it is perfect to share with my kids. 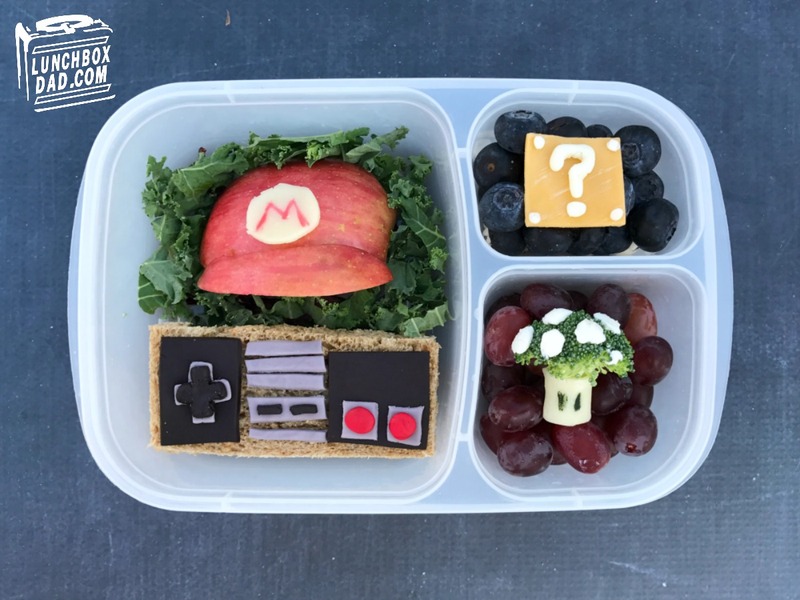 Ingredients: Whole wheat bread slice, half of a red apple, sliced turkey, provolone cheese, cheddar cheese, lettuce, blueberries (or favorite fruit), grapes, broccoli, cream cheese, Wilton's Shape N Amaze edible modeling dough (black, white, and red colors), read and black food coloring or food coloring marker, toothpick. 1. Cut the bottom third off an apple in a crescent shape. Attach it as shown with toothpicks to the larger piece of apple. The shape then makes Mario's hat. Cut a circle from white provolone cheese. Write an "M" on it using a small amount of red food coloring and a toothpick or a red food coloring marker. Place on Mario's hat. 2. Cut crust off of bread slice. Cut bread in half so it is in a rectangular shaped. Place turkey in the middle of the two rectangle pieces. You can also use a nut-free spread and jam. Place in main lunchbox compartment and spread lettuce in the rest of the compartment. Put Mario's hat in the compartment above the controller. 3. Form the black, gray, and red parts of the controller using Wilton's Shape N Amaze. You can mix white and black to make the gray. Place pieces on top of sandwich as shown in picture. 4. Drop grapes in side compartment. Wrap a small piece of provolone cheese around stalk of broccoli. Draw two spots for eyes using black food coloring. Press dabs of cream cheese on the head to make spots. Put "Toad" character on top of grapes. 5. In second side compartment drop blueberries. Cut a square from a piece of cheese. 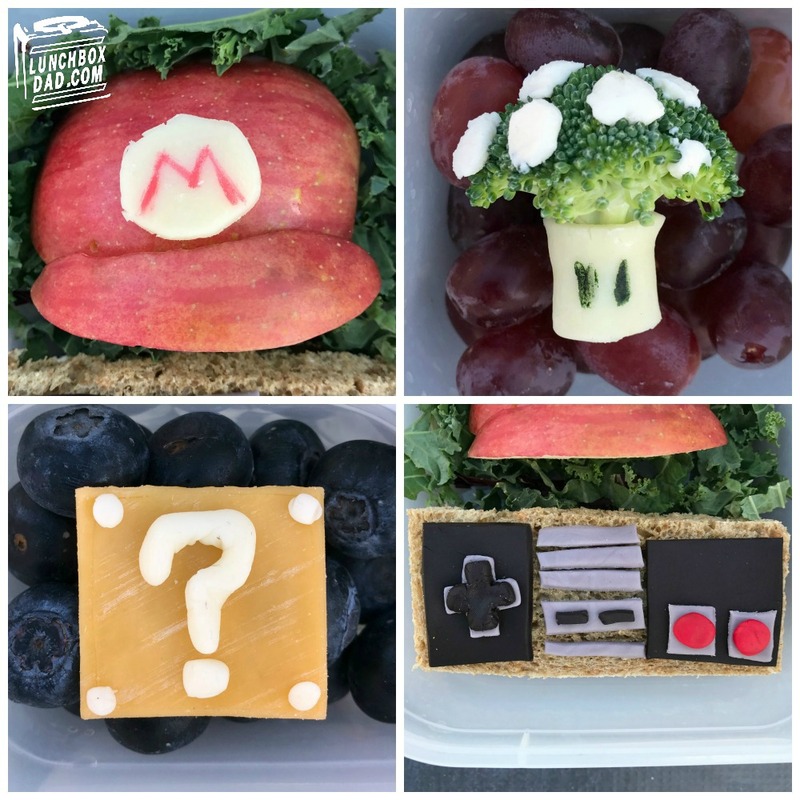 For the white question mark and dots on the corner you can use edible modeling dough, tortilla, or white cheese. Place question mark block on top of the blueberries. Serve to your kids and they will be ready to save the princess! 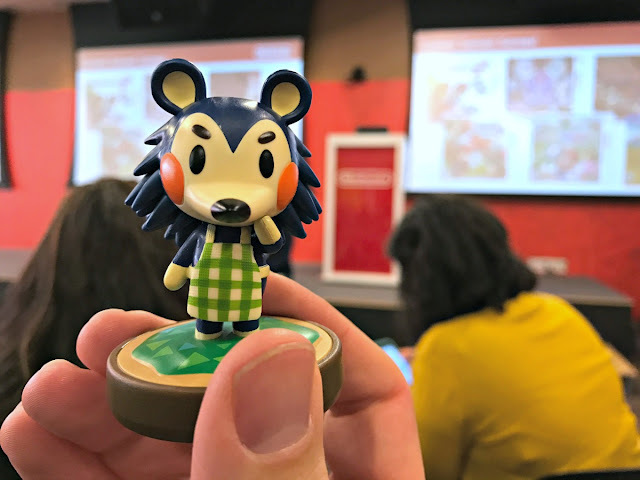 Now that you've heard about the lunch, here is what you need to know about our experience at Nintendo headquarters. The excitement actually started before we left Oklahoma City to fly to Redmond. Nintendo sent both of my kids new 3DS XL systems with a few games. These were the first video game systems that my children have ever owned so it was a whole new experience! 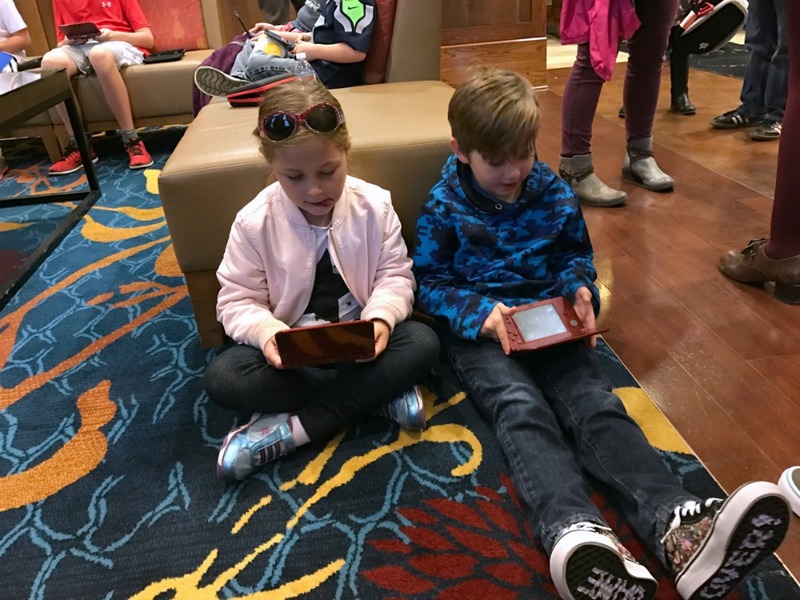 When we were waiting for the bus to pick our group up at the hotel, after we arrived in Redmond, every kid had their 3DS out and were having so much fun playing and meeting new friends! A number of the games are cooperative and you can interact with others who are playing the same game on their own 3DS systems. We began our adventure by having breakfast with Mario and Luigi. 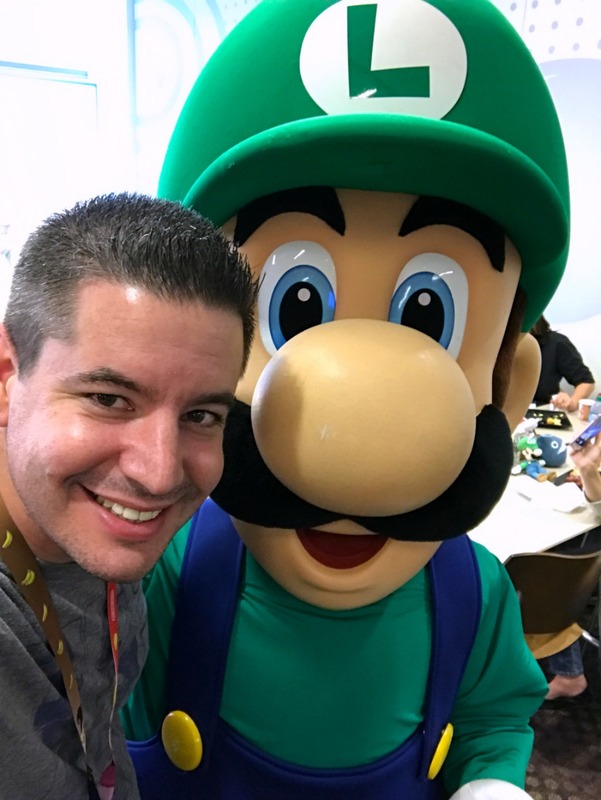 I had to get a selfie with the man in green himself! From there we learned all about some of the 3DS games coming out for the holidays. Believe me, there are so many things to be excited about. 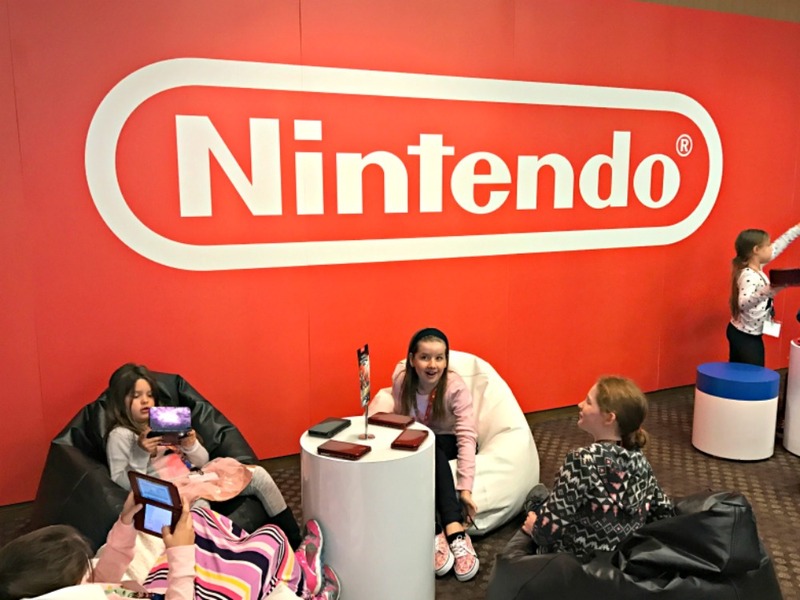 We also had the chance to hear about the history and mission of Nintendo and how selective they are in their partnerships. Did you know that the company started over one hundred years ago by selling playing cards? 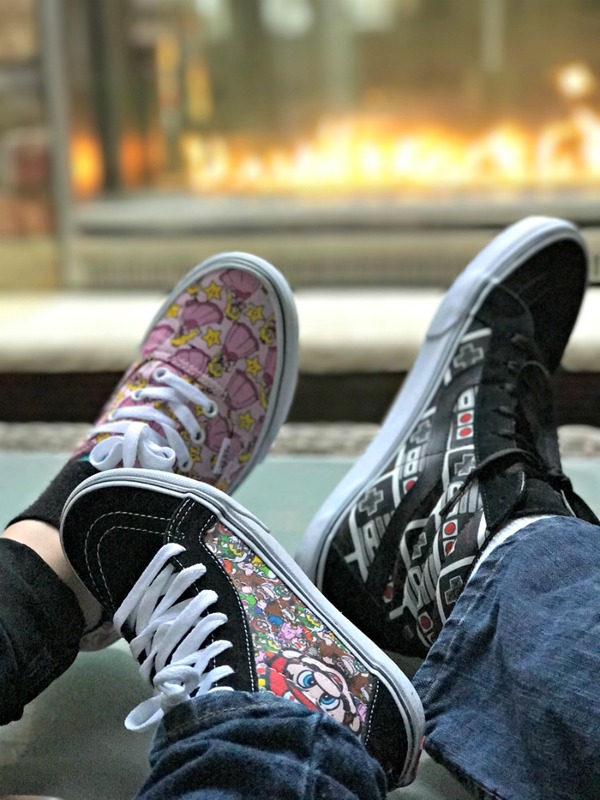 Good thing we had our Nintendo Vans on for the day, they matched the shoes that the president's was wearing! At this point, we were given a behind the scenes tour! 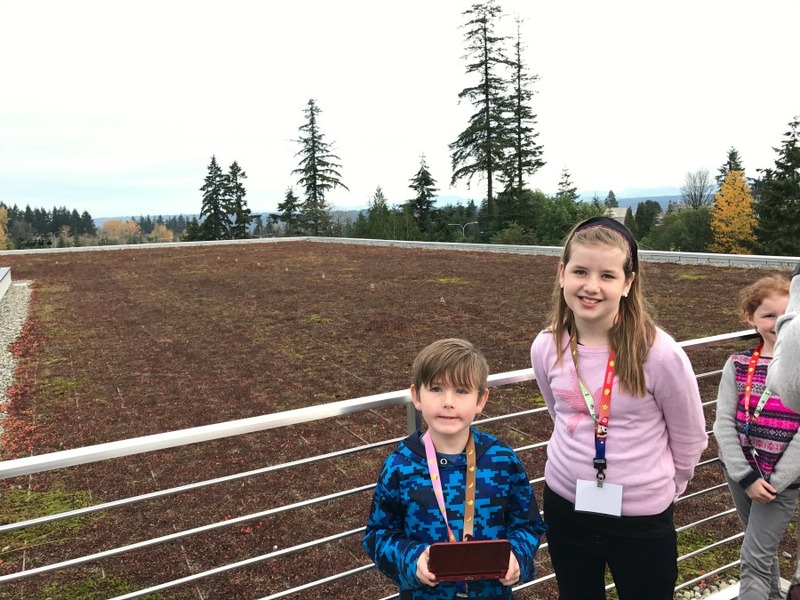 Unfortunately we couldn't take pictures of the first arcade games, or the incredible museum that holds every piece of Nintendo history that you would want to own, but the roof had some breathtaking views. After lunch, one of the exciting games we learned about was Pokemon Sun and Moon. It has since been released, but it was the highest selling pre-release game in Nintendo history. In other words, more people reserved this before it came out than any other game that the company has ever made. My son already told me that he wants it for his 3DS. By the way, did you know that Nintendo makes figures that interact with the 3DS and unlock special characters and abilities? They are called Amiibos (one shown below). You need to check into these because they add a whole new dimension to the games. 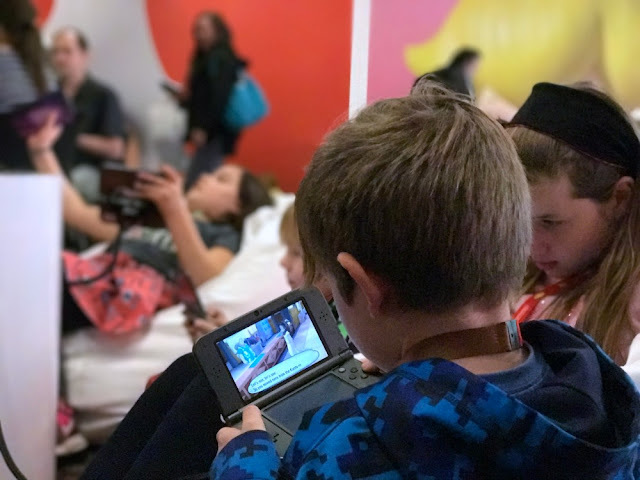 One of my top takeaways from the day was how serious Nintendo is about helping parents. The parental controls on the 3DS are no joke. For example, the system won't even play a game that has a higher age rating than is set by you the parent. Also, the Nintendo website can be extremely helpful in assisting parents in choosing just the right game for your child. With the holidays coming up, I would definitely recommend you look at a 3DS for your kids. There are a number of different models, and as a parent, this is definitely better than your default option of handing them your phones. One of my favorite parts of my kids having the 3DS is that they actually work together on games. They eagerly show each other the progress they've made and they help each other out on difficult levels as well. I can't wait to see what Nintendo comes out with next for the 3DS. Now excuse me while I go back to reliving my childhood by playing the NES Classic edition.